Did you face challenging circumstances when you were a teen? Many of the teens in this photo face them now. Fortunately, organizations like R.I.S.E. Yoga for Youth are stepping in to help. 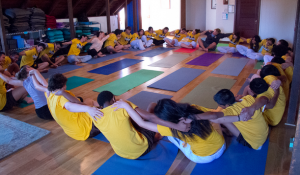 R.I.S.E brings yoga and wellness education to needy schools in the San FranciscoBay Area, to serve 1,000 teens. My family and I are helping R.I.S.E. increase their profile and earned income level. I’d love it if our entire Belief Energy community advocated on their behalf and made their campaign a huge success. Let’s help them exceed their $30,000 campaign to expand RISE Yoga for Youth to six more San Francisco schools. Thanks for donating and/or “liking” and “sharing” their important campaign to bring more BEing to our communities. This entry was posted on August 16, 2014 at 6:13 PM and is filed under Belief Energy. You can follow any responses to this entry through the RSS 2.0 feed.